The global economic slowdown dampened U.S. manufacturing again in November, according to the Institute for Supply Management. The trade group’s index showed the industrial sector contracting for the first time in three months, with the employment component shrinking for the first time in three years. The Commerce Department provided more evidence of housing’s revival with higher-than-expected construction expenditures in October. Spending on residential building rose 3% from September and was up 19% from October 2011. Through the first 10 months of the year, residential construction grew 13% from the same time last year vs. less than 8% for non-residential building. Americans bought more motor vehicles in November than anytime since February 2008, aside from the federal Cash-for-Clunkers program. The trade group Autodata Corp. reported that dealers sold an annual rate of 15.5 million vehicles last month, led by imported trucks. But domestic cars outpaced all other categories in year-to-year comparisons. 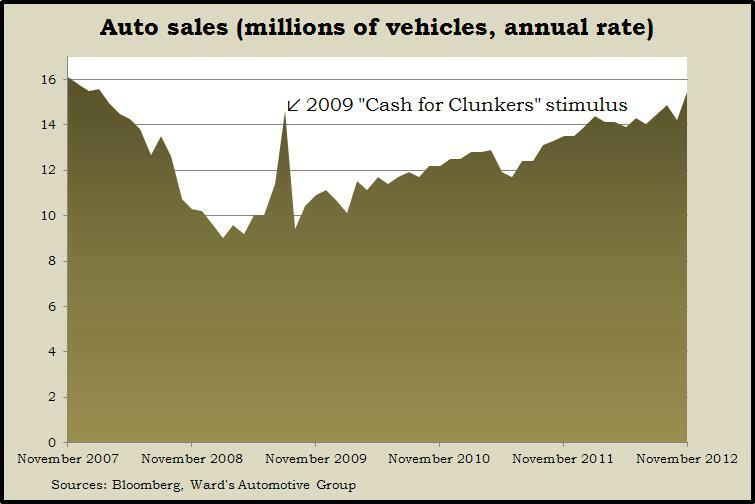 While auto sales can indicate the health of consumer spending, Hurricane Sandy also played a role by boosting demand for replacement vehicles along the Atlantic coast. Employers reluctant to add to their payrolls were able to get more productivity out of their existing workforce in the third quarter, according to revised data from the Bureau of Labor Statistics. Output per hour increased at an annual rate of 4.2%, twice the rate in the second quarter – a good sign for corporate profitability. Labor costs declined for the fifth time in six quarters, suggesting continued constraints on consumer spending and little pressure for price inflation. A sign that the manufacturing sector was holding its own in October against the global slowdown is that factory orders unexpectedly increased that month, according to the Commerce Department. What’s more, orders for non-defense capital goods excluding aircraft – an indicator of business investments – rose 2.9%. Although manufacturing drove the U.S. emergence from the Great Recession, non-manufacturing accounts for the majority of the economy, so it was a positive note that the ISM Non-Manufacturing Index rose more than expected in November. It signaled the 35th month in a row of expansion, with new orders at the highest level since March and business activity the highest since February. A downside was that the employment component for the index barely showed expansion, suggesting companies are busier but not hiring much. Still buffeted by Hurricane Sandy, the moving four-week average for initial unemployment claims rose for the fifth week in a row. The Labor Department said weekly claims settled below the critical 400,000 mark for the second week in a row. But the four-week average stayed above 400,000 and higher than the year-ago level, which hasn’t happened since 2009. Employers added more jobs than expected in November, little affected by Hurricane Sandy, the Bureau of Labor Services reported. The mixed-bag report showed fewer jobs added than initially estimated in September and October and a slower rate of growth in November than the average month in 2012 or 2011. Still, employment continues to rise, reaching its highest level since November 2008. The less reliable household survey showed the percentage of unemployed Americans recently looking for work dropping to 7.7%, the lowest in four years.